As a young defender I was taught that if the ball was gong in and I could only stop it with my hand (and it was late in the game) to do it and let the opposition take the penalty. 90% is better than 100%. This is a part of futbol. 3 million Uruguayans are very happy Suarez did it, and I for one, can not fault them their joy. Agree with Gringos. Any player on a team would have done what Suarez did, it's instinct, you do it because of the slim chance the penalty won't go in. Suarez also paid the price for his action, but he will see his team play in the semi-final, all worth it really.I don't think this a special cruelty. The cruelty is that Gyan missed the penalty. 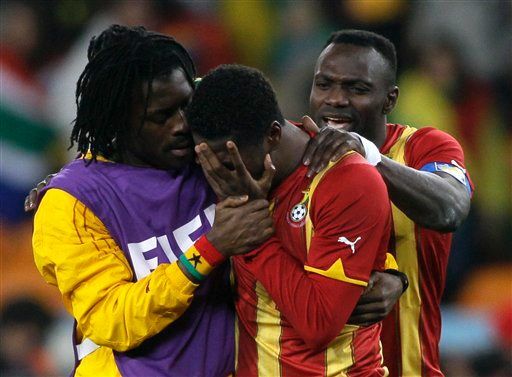 Also I love Ghana's side this year, but Gyan was not excellent throughout this tournament. His winner against USA has made him a superstar, but he was very wasteful in the final third, choosing to shoot instead of pass, pass instead of shoot, frustrating stuff really. André Ayew (the winger) was better throughout and it was a shame he did not play because of a bogus second yellow card against the USA. Kevin Prince Boateng was better, he really stepped up in the last few games. I really have a hard time accepting this as instinct, let alone a legitimate tactic, since it goes against the fundamental directive of the sport. The win-by-any-means attitude of high-level sports is what's producing cynical moments like these, and this is one of the most sour wins / bitter losses I've seen in a long time. Unless these actions produce the opprobrium they invite, teams are forced to adopt similarly suspect tactics in order to compete - seen in the proliferation of diving. Everyone's familiar with the goaltending rules in basketball, but rugby (a sport whose ethos soccer could certainly stand to study) has a law called a 'penalty try'. If the ref thinks (the ref doesn't have to be certain, or prove, etc.) that player misconduct has prevented a try, the ref can award a penalty try (same value as a normal try) even if the ball was never touched down nor even crossed the try line. According to the soccer laws, a red card + ball on the spot is awarded if the opponent was denied an opportunity at goal. In this case, Ghana was denied a goal - not an opportunity. To my way of thinking, a penalty goal is appropriate and something FIFA should look at. The ball was on its way into the net if not interfered with illegally. The trump card Suarez gambled on worked this time, and his red card, the price of his action, is totally out of alignment with Ghana's price, not moving on, which they immediately would have based on their strike. (As a person who has taken many PKs after 120 minutes of play, I can assure you that a PK is not a gift to shellshocked legs). Based on how significant even a one goal lead is in modern play, why not bat a ball out of the net in the 50th minute and pack the box with 10 players? I've seen hundreds of plays where defenders dive, feet first, to save balls on their way in to the net. Seeing players use their hands like this rends something quite deep in me, a purist love of the sport plus a sense of justness and rightness. Graeme, That goes in my top 10 comments of all time. Thank you for lending your eloquence to this post! I felt injustice when Mexico lost to Argentina, because that non-offside call was shocking. Tevez got away with it, and he said he knew he was offside, yet he still celebrated the goal with a lot of enthusiasm. What does this say about Tevez's character? Is anyone even asking the question? 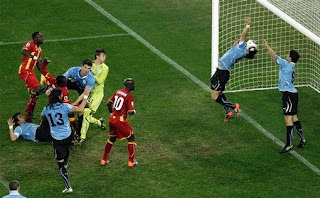 Yes football laws are flawed, Uruguay would have been the ones feeling gutted if the ball went in because Ghana should not have been awarded a free kick in the first place, there was no foul committed by Fucile. In addition, Appiah was offside when he tried to kick the ball into the net. Suarez is not a hero or a villain,just a player with good and bad moments. Degane, I don't really wish to vilify Suarez specifically. I'm more concerned with the climate of the sport that almost seems to require that players skirt the rules in order to ply advantage. I don't mean to moralize, and I know I'm in dodgy territory and occasionally sound like someone from another century (though I'm not deluded enough to think that the past was only full of honest people nor that the future shows only the possibility of more and more dishonesty) but it does tug at some anachronistic sensibility to see such blatant rule-breaking. I can't disagree with you about the phantom foul called on Fucile - I've tried to get another angle on it and see if there was any contact that led to the fall, but it looks like Fucile never touched the Ghanaian player. Not wanting to get into a causal regression discussion on events that take place on the pitch, but those small missed calls happen dozens of times a game in both directions and the refs sometimes even them out, whereas Suarez's act is clearly a moment forced to its crisis - so it feels (and was) significant and immediately game-changing in and of itself. I detest diving, granted, but seeing players using their hands gets to me at my most basic understanding of the construction of the sport. I shared your injustice on Tevez's goal - Mexico was playing beautifully. It's a sport that requires and produces intense emotion, and I've seen so many examples of teams coming to pieces after the apparent weight of opponent, referee, and God (I'm not religious) combine to thwart them. And the consequences of those goals are felt beyond the scoreline - teams are forced to play tactically differently when down. It does grind to see the celebrations after suspect goals (or goal denials), but I won't heap vitriol on Suarez or Tevez. I'd like to think the world stage and high stakes would produce a higher level of conduct and sportsmanship, but apparently the pressure is so much that when relieved, the means are absolved. The problem can be fixed without attacking the tender sensibilities of these famous, wealthy, healthy, adulated athletes. I don't want everything done by robots, of course, but even I can begin to feel that FIFA is a protection racket for the darlings of the game when I see the ref trotting back to the center circle with Fabiano, smiling with him and patting his own bicep after Fabiano's double handball goal. I still feel echos of the froth I fell into when Dunga handled the ball in the box against Scotland in '98. Perhaps I just have an overly-refined sense of justice (possibly based on my team's continuing Icarus complex in qualifying brackets). Anyway, discussing this with you beats working, and despite all the controversy I'll be sad when it's over. Oh... Appiah was on. By the time he made contact there were three players keeping him on. Graeme, I also enjoyed this conversation with you. I am glad we able to discuss things this way, disagree and agree. Thanks for taking the time to engage in discussion with me. I look forward to future ones.